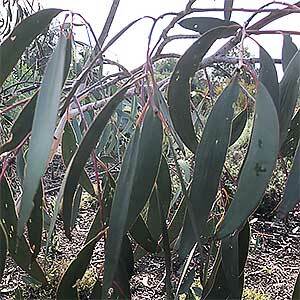 An attractive small weeping Eucalyptus for the home garden is Eucalyptus lacrimans, commonly called the Weeping Snowgum. Growing in the alpine areas of southern new South Wales, it can reach up to 10metres, usually less. 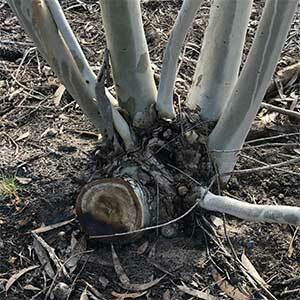 Characterised by an attractive smooth white to grey trunk, the bark peels in narrow strips. The flowers are small and white appearing in summer and attracting bees and birds to the garden. A well drained soil and a sunny position are essential. Being an alpine plant, Eucalyptus lacrimans will tolerate wet winters, however is does not grow well in wet humid summers. This is a species that has a lignotuber, and it can be pruned back hard. This makes it a useful garden plant as pruning creates attractive new foliage as well as maintaining a smaller size. Height – To 10 metres usually smaller. Spread – To 3 – 5 metres .